Spring is in the air. Days are getting longer. Grass, flowers, and vines are starting to bloom. The lake is sparkling. The sun feels warmer. So, for the first time this year, you’re sitting outside enjoying a gorgeous day and a glass of wine. You’re at Figula Borbár. Wine bottles and glasses line the walls of the cute wine bar. Wine barrels stand at the entrance. Tall glass doors have been propped open to let in the fresh air. While wrought-iron tables and chairs are scattered across the sunny terrace. You’re sitting at one of them with a plate of bread, cheese, meat, and olives in front of you. An empty glass of crisp Olaszrizling, your favorite of Figula’s locally made wines, is off to the side. You definitely need a refill. Figula Borbár sits on a waterfront promenade just steps from the lake. Figula Pincészet, the vineyard that produces the lovely wines you just tasted, is perched on a hillside just a few minutes to the north. Balatonfüred, an old spa town, lies in between them. They all overlook Lake Balaton. 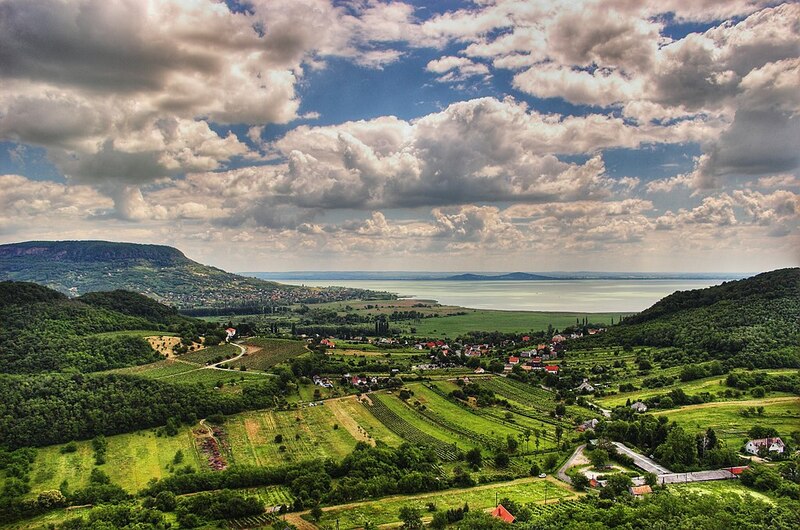 Lake Balaton is the largest freshwater lake in Central Europe. Since the lake is only two hours from Budapest, it’s one of Hungary’s most popular tourist destinations. Communist-era resort towns sit on the south shore. Green mountains, endless vineyards, and Füred are on the north shore. While traditional little cottages, with densely packed straw roofs, are tucked everywhere with a water view in between. Füred is adorable. The center of town is filled with elegant Baroque buildings, churches, and mineral-water springs. Tree-lined avenues lead to waterfront promenades, bike paths, and boat-filled marinas. Tihany, a peninsula with an 11th-century Benedictine abbey, lies to the west. Handsome villas, much grander than the cottages around the rest of the lake, overlook it all. Villa Vitae is one of those villas. The beautiful villa looks like it was plucked out of Provence. It features its own vineyard, a sun terrace, and an outdoor pool. It has its own spa with a Finnish sauna, an infrared sauna, a steam shower, and whirlpool baths. It even has a 15-seat cinema. Best of all, though, is it’s a hotel. Rainfall showers, thick terry cloth bathrobes, and L’Occitane products are in the rustic-chic rooms. Three suites add soaking tubs and uninterrupted views of the lake. The villa will also loan Vespa scooters and Piaggio electric bikes, so you can easily visit the rest of the surrounding wineries, including Figula Pincészet. It looks like you found more than spring in Hungary.